Vegas is gonna be nuts!!! WOW! It is going to be c-r-a-z-y!!!! Oh man, it's going to be so real deal, real soon! Thanks to Matt Lolli for bringing this video to my attention. Yet another flaming a$$hole in the House! I know this site is accessed mostly by the BMX community, but as you all know I am big into all aspects of riding. The road cycling scene is under direct fire due to numerous incidents of "doping" (use of illegal, banned substances to enhance ones performance) over the past years. I've started a new underground project called "DEATH 2 DOPERS". This new idea is fueled by my eternal hatred for the weak and gutless that need to poison their bodies with illegal substances to gain the upper hand on the competition. I'm just getting the ball rolling, but stickers will be available next week and shirts by late September. Keep your eyes peeled here for the latest info. and check out the DEATH 2 DOPERS MySpace Page that is currently under construction. DOT lead by an A$$! PBS NewsHour with Jim Leher, DOT Secretary Mary Peters was interviewed by Gwen Ifill. Peters, when asked about a possible gas tax increase, repeated President Bush's response - No, there can be no tax increase because Congress is wasting the money they already get. Peters cited "bicycle paths" as a prime example of the waste because bicycles are not a transportation use of the gas tax money. One wonders if this is not a direct attack on Minn.Congressman Jim Oberstar, whose district includes the fallen bridge. Oberstar is the biggest supporter of bicycling in congress. I am shocked (sort of) that Peters is attacking bicycle transportation as just a waste of money. This administration is back in the 1950's Auto Uber Alles mentality - we have not crossed that bridge into the 21st Century yet. The dinosaurs of the auto industry are backed into a corner and fighting for their lives - but is attacking the little bicycles is the best they can do? Its also disappointing that the administration is attacking Jim Oberstar for his efforts to get the Minneapolis bridge repaired along with raising all the funding for transportation maintenance, by using Oberstar's support for bicycles as a weapon. Come on lady! Get your head out of your a$$! Ever hear of global warming? It's not the fault of all the cyclists in the world! Yesterday was the jam in East Hampton to raise money for the skatepark that is hopefully going to be built next year. 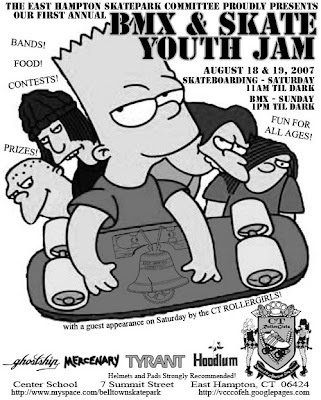 The East Hampton Skatepark Committee did a hell of a job organizing a great event with tons of ramps, vendors, bands, etc. Take a look at the photos T and I shot, Click Here. So Don Pavelka is in the process of designing a new TYRANT shirt. Don's shirt will be a Limited Edition item and only a small batch will me screened. If you don't know who Don P. is smarten up and educate yourself by CLICKING HERE. Rail double peg to whip. I've received a few smart a$$ e-mails from people asking if I'm "still alive?" and "do I still ride BMX?" I've been riding like a mad man, but I will admit it hasn't been on the BMX bike. My schedule is crazy between work, road training nightly, working at Pedal Power on Saturday's, and a race every Sunday up until Columbus Day. In addition, I'm traveling to INTERBIKE for a week in September and hoping to get out to see Shawn Hebrank in Minneapolis in October. Thanks to the peer pressure of Matt Lolli racing will continue into the Winter, because I'll be racing the cyclocross season for the CCNS/Pedal Power Team as well. 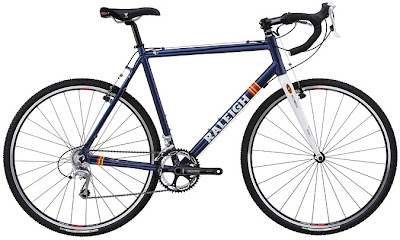 Pictured below is my new cross ride that Bill at Pedal Power tracked down for me. SO...long story short, my BMX riding is pretty much limited to weekday nights and Sunday's I'm not racing. To all you guys antagonizing me... remember, the phone works both ways! Call me when you're riding and I'll make an effort to be there! 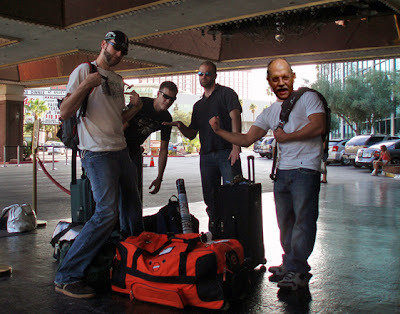 The trip is booked...once again we will be headed out to Las Vegas for INTERBIKE. This year it will be Digger Davis, Matt Lolli, Spencer, and myself representing Pedal Power in "Sin City". It should be one hell of a trip! BE THERE! SUNDAY AUGUST 19TH! NEW TYRANT MERCH. FOR SALE!! !